President George H.W. 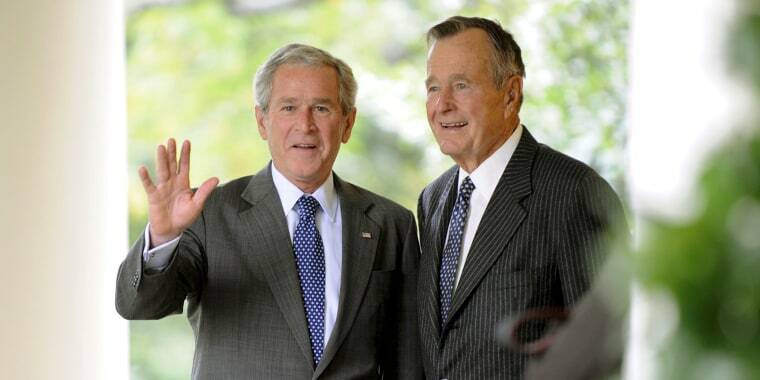 Bush and President George W. Bush exchanged loving words. As the country mourns the death of President George H.W. Bush, the United States’ 41st president, new reports give intimate glimpse into the president’s final days — including the former president’s bond with his son, President George W. Bush. President Bush died peacefully at his Houston home, surrounded by friend and loved ones. According to the New York Times, shortly before the elder Bush’s passing, President George W. Bush called his dad on speaker phone, hoping to share a few last words. The son told his father he loved him and that he was a “wonderful dad,” and the 41st president was able to return the gesture, telling his son, “I love you, too.” He passed away shortly after. The last words were emblematic of a father-son relationship that has always been full of love and guidance. “First and foremost, he was a great father,” George W. Bush told his daughter, TODAY correspondent Jenna Bush Hager. The father-son bond between the two was solidified by their shared political experience, especially dealing with criticism. “When it’s your own son, it’s hard to take,” Bush, Sr., said. Bush’s sage wisdom and support have even transcended party lines, as he developed friendships with notable Democrats over the years, like President Bill Clinton, who Bush viewed a son.